Gemprint® is the world leader in diamond identification. We offer the Gemprint® diamond identification system to positively identify & register your diamonds. How is a diamond matched to it's Gemprint®? 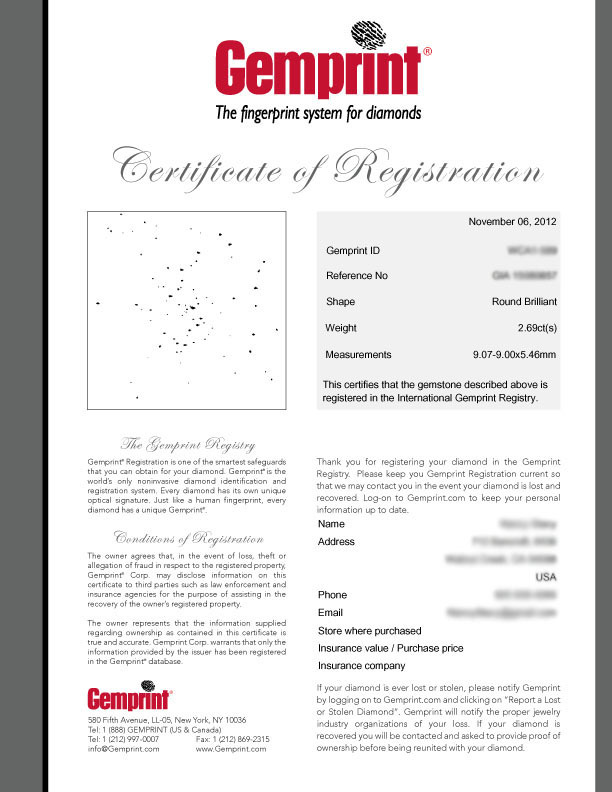 What does a Gemprint® certificate look like? What are the benefits to the diamond Owner? Gemprint® is the world’s most sophisticated, non-invasive, positive diamond identification technology. It records the unique optical "fingerprint" of each diamond. Just like a human fingerprint, every diamond has a unique Gemprint®. Invented in 1976, this patented and proven technology has been used by the FBI and the Canadian Government. When a diamond is Gemprinted®, the owner receives a certificate containing the diamond's unique "fingerprint". The diamond is then registered in the international Gemprint® database together with an electronic image of the diamond's Gemprint®. This Gemprint® can then be used to positively identify the diamond in the event that it is stolen, lost or even accidentally switched with another diamond while jewelry is being repaired. 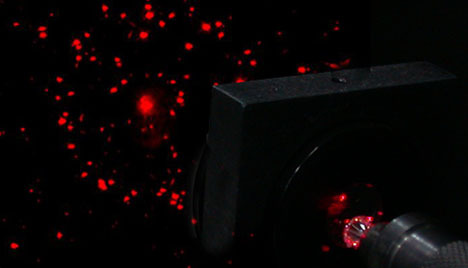 A diamond is placed into a Gemprint® machine where a laser beam is directed through the table (the top) of the diamond. The laser beam is then dispersed by the diamond and reflected back out of the stone. The dispersal pattern formed by the laser light coming out of the diamond is unique to that specific diamond. The Gemprint® is an image of that dispersal pattern. Assume that your diamond was stolen and the police recovered a diamond that you think may be yours. The recovered diamond can be Gemprinted® and it's Gemprint® compared to the Gemprint® of your diamond. This is done on a computer using very specialized matching software. The two Gemprints® are superimposed and rotated until the computer determines the best fit between the two images. It then marks the matching points. In the images below The green pattern is the Gemprint® of one diamond and the red pattern is the Gemprint® of another diamond. The sample on the left shows only a 7% match between two diamonds and the one on the right is only a 3% match. 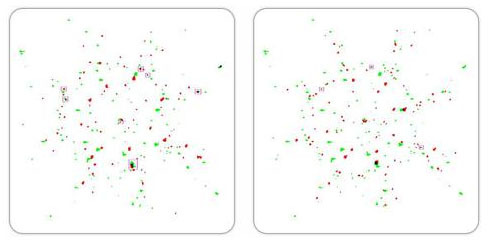 Just like in fingerprint matching, positive identification requires a high percentage match. Neither of these two comparisons indicates a match. The images below are an example of a matching Gemprint® pattern of the same diamond. The computer rotates the two patterns (red and green) to find the most accurate alignment, and then marks the matching points (image on right). This is a 99% match. The image below is a sample Gemprint® certificate with identifying information obscured. Investment Protection - If your diamond is ever lost or stolen, notify Gemprint® immediately. Your diamond will be flagged in the Gemprint® database helping to speed recovery. Identification – Stolen jewelry is often recovered by the police. With a Gemprint® you have a way to positively identify your diamond, even if removed from its setting. Forensic Evidence - The Gemprint® registration of your diamond is court-accepted evidence irrefutably proving ownership. Insurance Discount - Gemprint® is recognized by most insurance companies as a safeguard for diamonds. Many insurance companies offer a 10% discount if your diamond is registered in the Gemprint® International Registry at Gemprint.com. Some insurance companies even require a Gemprint® for replacement coverage for high-value diamond jewelry. Click here to see a list of insurance companies that offer Gemprint® discounts.